A postmenopausal fifty-year-old female patient with high cholesterol and triglyceride levels had previously taken conventional medicines for 2 years to address the problem. At that point, she decided to stop taking her medications, however a month later, her cholesterol levels shot right back up. Consequently, she was forced to continue relying on medication to control her blood cholesterol levels. The patient had concerns about the side effects of such medications, and consequently wanted to see if Chinese medicine would be of benefit. Dr. Xue-ya Huang from the TCM department at Hsin Chu General Hospital in Taiwan says that the patient had a soft, dusky red tongue with stasis maculae, and a pulse that was slippery and rapid. Because of these signs, and the observation that she had a phlegm-turbidity, blood stasis constitution, she was given the following medicinals to invigorate the blood and expel stasis: Persica & Achyranthes Combination (Xue Fu Zhu Yu Tang) and Citrus & Pinellia Combination (Er Chen Tang). 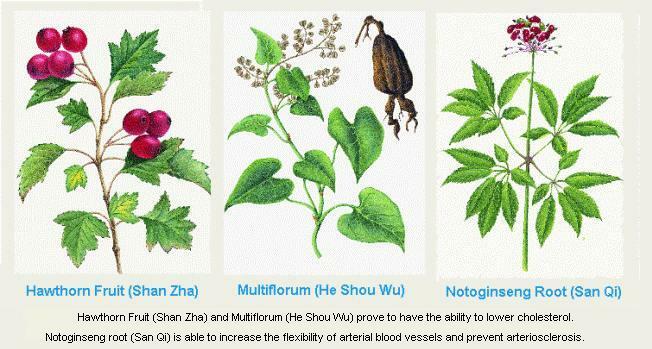 Added to the combination was Hawthorn Fruit (Shan Zha), Multiflorum (He Shou Wu), Salvia Root (Dan Shen), Notoginseng Root (San Qi), and Astragalus (Huang Qi). After taking the formula for roughly three months, the patient's cholesterol levels had normalized and her other symptoms of dizziness and soreness and pain in her shoulders had also resolved. Currently, the patient returns every three months to the clinic, and is given a month worth of herbal medication. Dr. Xue-ya Huang points out that in Chinese medicine high cholesterol is often ascribed to phlegm turbidity and blood stasis. This is particularly true for those who eat too much and whose diet consists of an excessive intake of fats, as well as the elderly, whose kidney qi has gradually weakened and resulted in the creation of phlegm-turbidity internally. In both cases phlegm-turbidity obstructs the movement of qi in the body and after an extended period this results in blood stasis. Consequently, the treatment of high cholesterol must take into account these factors. After entering into the later stages of ones life, or after menopause, the functioning of the zang-fu organs in the body begin to decline. As a result, many people discover that high cholesterol is not a problem solely of the overweight; in the clinic, there are many patients with high cholesterol that are of average build or relatively thin. In the treatment of high cholesterol with Chinese medicine, the lowering of cholesterol is achieved by way of regulating each of the zang-fu organs using herbs form various categories. Dr. Xue-ya Huang says that medicinals that invigorate blood, and transform stasis have the ability to promote blood circulation and increase metabolism as well as prevent cholesterol from depositing on the walls of the blood vessel. Consequently, these categories of medicinals are very important for those who have problems associated with poor metabolism. Persica & Achyranthes Combination (Xue Fu Zhu Yu Tang) contains medicinals that regulate qi and invigorate blood and is particularly suitable for people who do not exercise much or have blood stasis type constitutions. The primary function of Citrus & Pinellia Combination (Er Chen Tang) is to expel excess metabolic waste products, so that they do not accumulate in the body and lead to disease. Much research has been done on Hawthorn Fruit (Shan Zha) and Multiflorum (He Shou Wu) that has shown them to have the ability to lower blood cholesterol. Salvia Root (Dan Shen), Notoginseng Root (San Qi), and Astragalus (Huang Qi) are able to increase the flexibility of arterial blood vessels and prevent arteriosclerosis, thus preventing myocardial infarction and cerebral apoplexy. The combined effects of these medicinals are long lasting and have no side effects. Dr. Xue-ya Huang recommends that patients would benefit further if they controlled their diet, got regular exercise and took Chinese medicinals periodically to take care of their blood vessels. In doing so would enjoy a higher quality of life.